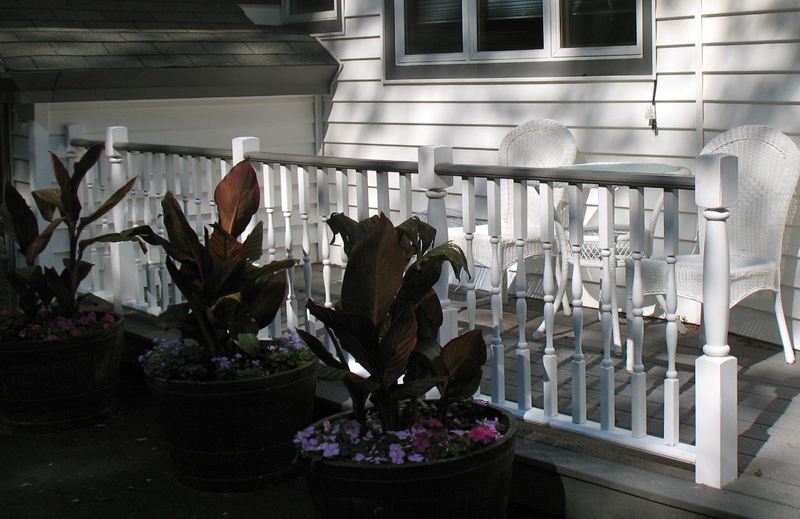 Each May my Dad would begin to plan his summer plantings for my parent’s Catskills home. Over the years he had added gardens and flowers to the property that was once owned by my grandparents. Where my grandfather once had a large vegetable garden, something my Dad had helped with for years, my Dad decided to focus on flowers. Some of my Dad’s planters at the Catskills’ house. He loved to garden. In the spring and summer, it was at the Catskills property. My parents would drive into Monticello and go to a garden center and pick out the perfect annuals. These he would plant around the front of the house and in the now filled in koi pond. In the back of the house he always planted around the garden he put around the well. And all along the side of the house were more gardens. Of course he had plants on their screened-in porch as well. He was always ‘puttering’ in the garden or with his plants. One year he was so upset with the deer eating his rhododendron, he went out and got hyena or coyote urine to keep them away. When the summer was over, he would mulch his flowerbeds to be ready for the next year’s plantings. My parent’s large cactus plant! The rest of the year he focused on indoor plants. He had many succulents, including a beautiful flowering cactus and a large spiny cactus. He kept them in great shape. As well as many other plants that grew in their living room, kitchen and on their terrace. My Mom and I had always joked about our winter ‘schlumbergera’ flowering cactuses (Also known as Christmas cactus). We fought over whose had more blooms. I will admit, my Mom and Dad won that battle. His love of plants worked to my benefit, as twice a year my parents came to spend 10 to 14 days with my family in Kansas. They came every Passover and Thanksgiving, and since Dad needed to keep active, I kept a list of ‘chores’ for him to do. Which meant every spring, he and my husband worked on outside gardens. When we first bought our home, 29 years ago. It was brand new, with no gardens. Over the years we have put in massive gardens and plantings. My Dad helped to dig out the first gardens. 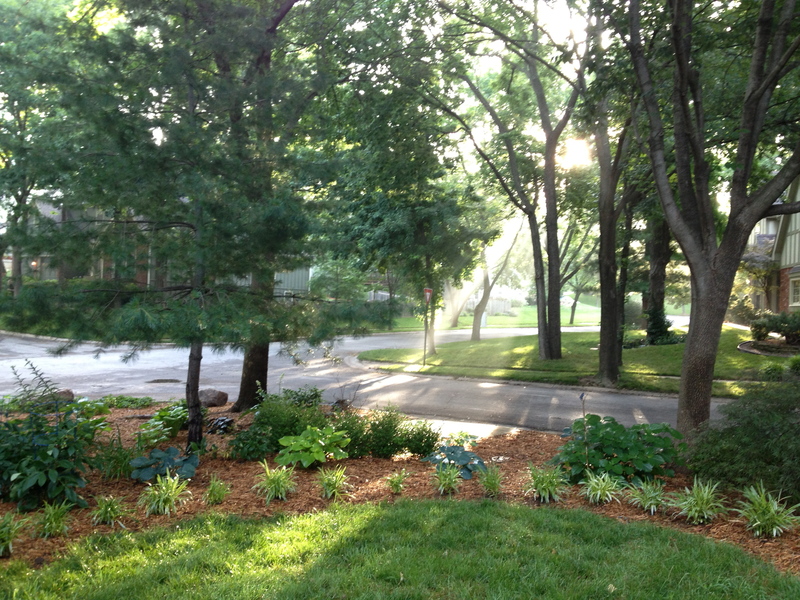 And as the plants and gardens grew, Dad was in charge of mulching and weeding. He also helped in choosing the perfect new plantings each year. A portion of my outside gardens. When my Dad became unable to do heavy work, he would just do the mulching with my son. We hired a gardener for the other jobs. And then when he could no longer even mulch, he would sit out on a chair and direct and chat with John the gardener. John and Dad had lots to talk about. Thanks to both of them I have wonderful outside gardens. In autumn, Dad would focus on my inside garden. I had many succulents, both inside and outside. But it was my inside ones that Dad kept going. Every autumn he would repot those plants that needed the extra space. He would trim back dead areas, and keep my plants look wonderful. When he was not here, I just watered and removed dead leaves. I waited for him for any repotting needs. I knew he loved to do it. When my children were little they always helped. It was a great bonding time for them. Then the unspeakable happened. My parents passed away nine months apart. It was a stressful time. My Dad did not come out in the autumn, as my Mom was ill. He did make it in the spring, but was unable to do his usual ‘chores’. When he fell truly ill, he ended up being in a hospital and then rehab for the last three months of his life. 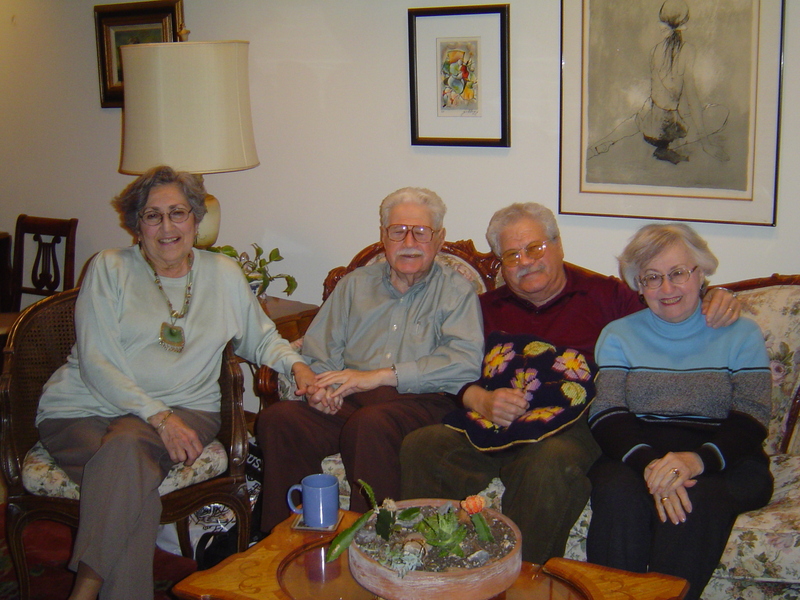 My Aunt and Uncle and parents with the cactus planter my Aunt now keeps. At his shiva, it was obvious his lovely plants needed help. My Aunt Mickey took the planter with succulents that was on the coffee table. My brother took the living ivy and small plants. My sister took the giant cactus. Since I lived in Kansas, I did not take a plant. Dad would have been happy to know his plants were in good hands. Over the past few years, since my parent’s deaths, I have not touched my succulents, except to water them. Included in my plants is an aloe plant that is over 50 years old. It had been my husband’s Mom’s. It became mine when she passed away 30 years ago. It, along with my other plants, began to suffer. A friend of mine would occasionally cut back the dead leaves. At times she watered them when she came. But even with her care, some succulents did not survive. I would take the empty pots and put them away. Eventually she told me that I had to re-pot and care for my plants. She was right. My Dad would have been very unhappy with me. Even though I was caring for the outside plants, I had ignored the inside ones. For some reason, this May I finally got the inspiration to fix my plants. I bought seven new succulents for inside. I bought several new ceramic pots. 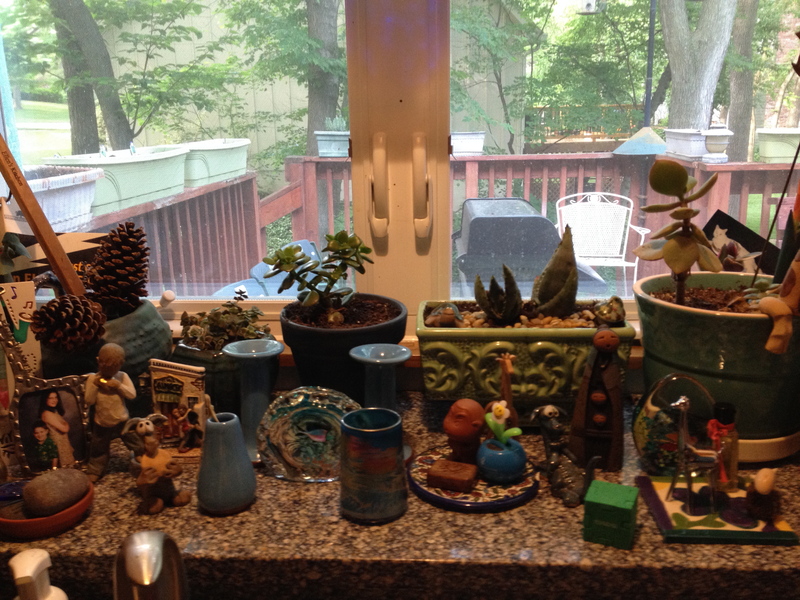 On Memorial Day, after I went to a veterans’ memorial service, I repotted my plants and I planted the new succulents. Just as my Dad always did, I put old newspapers on my counter. I got the potting soil and the new pots and plants. And for a good hour, I worked on my plants. Placing some of them on my kitchen garden window, and others in my planter. I planted so many that I ran out of room. So I put two on my cookbook shelf. While I worked inside, my husband worked outside. He planted herbs and flowers in the flower boxes on our deck. He planted new yellow speckled lillies in one of our outside gardens. And we planted a beautiful new peach-colored rose bush, called ‘Cinco De Mayo,’ in our front gardens. I chose this rose bush in memory of my Mom. I plan to plant a blue hydrangea for my Dad. We have white ones, but he always wanted some colored ones in my yard. As I finally fixed my indoor gardens and saw my planters filled with the life of new succulents, I felt a burden lift from my heart. Since the moment we moved into our home 29 years ago, my husband has been in a silent battle with the squirrels that share our land. It started simply. We wanted to feed the birds. There are beautiful trees in our backyard, including a mulberry tree, which attracted the birds. But we wanted to help them in the fall and winter. So my husband wanted to put bird feeders on the deck. His first ones were failures. Within minutes of the bird food entering the feeder, they were emptied. Not by birds, but by squirrels. Over a two-year period, my husband tried every type of birdfeeder and squirrel baffle. Finally he found the bird feeders we have now. The squirrels can no longer get to the bird food. The only problem now is how quickly the birds eat the food! His second issue with the squirrels revolved around our flower boxes. 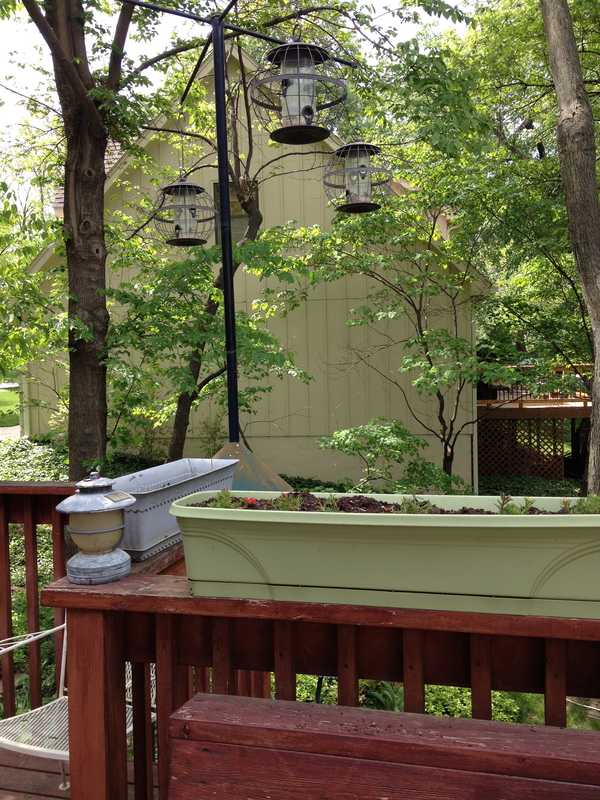 We have nine flower boxes adorning our deck. Each fall the squirrels bury walnuts in the flower boxes. Then they make a mess digging them up, throwing dirt everywhere. In the spring they often dig up the first flowers we plant. This is annoying, but there is really nothing my husband can do to stop the behavior. So he has learned to live with it, and just replants the flowers. Issue number three caused quite a battle. Each spring my husband would plant tomatoes. He would nourish them and watch them grow from tiny yellow flowers into little green tomatoes, until finally they were large and ripe enough to eat. We used to keep them on the vine until they turned red. BIG mistake. The squirrels would pick those red tomatoes, take one bite out of them, and then leave them on the deck right outside our kitchen atrium doors so that we could see the ruined tomato! It was so frustrating. My husband dealt with in a mature way. He started planting cherry tomatoes. Even if the squirrels ate a few; even if they took a bite or two, they still were not wasting an entire large tomato. Also, with cherry tomatoes, there were always some for us. Additionally, he started picking the tomatoes before they were totally red, and we let them ripen in the house. But this final battle has devastated my husband. It has been a pitiful and emotional week. We found out last year that the ash borer has entered our state. This is disturbing to us because we have eight beautiful ash trees on our property. The word from local arborist is that within five years all the ash trees might be dead. We have already suffered from the destruction of the elm trees. So my husband decided he would take proactive measures. He would start growing trees now. He first planted a maple from seed. And it grew! He was so excited, he decided on another challenge. He really likes oak trees. So last fall, during one of our walks, he picked up acorns from the ground near an oak tree. He selected the best acorns he could find and brought them home. After much research, he put these acorns into a zip lock bag with a bit of water, and kept them in our refrigerator all winter. He would check on them, add water when needed, and nurture them. In mid March, he took the acorns outside and planted them in our flower boxes. He covered each box with the heavy metal tops to our outside tray tables. The trees could get water and light, and had room to grow. The metal screens kept the squirrels out. Every single day after work, he would go out side to tend and speak to his acorns. And then, miraculously saplings appeared: six baby oak trees. He was so excited. He told all his friends his plans to replace our ash trees with the oak trees that he was growing from seed. Slowly they grew to about six to eight inches high. He decided it was time to make a change. They all had leaves on them. So he took them out of the flower boxes, away from their protective metal screens, and planted them in individual, deeper pots. He continued to visit them each day after work. He was beyond excited. He came home and went outside to check on his trees. He was only out for a moment, when he came back in and flopped on a chair. I could see the dejection in his face. The squirrels had taken each and every acorn seed; dug them up and ate them. Besides that, they had stripped each little sapling of all of its leaves: leaving devastation, disaster, depression and destruction of dreams. My husband was beyond comforting. He had nurtured and nourished those saplings. Now all his work was destroyed. I was so sorry for him. It was the saddest I have seen him in a long time. “Perhaps you can try again next year,” I said. “No. I am done. I never thought they would eat them once the saplings were this big. I am done,” he said as he pouted in distress. The squirrels have won this battle.